All eyes are on Twitter, after the social media giant unveiled its fourth-quarter earnings yesterday. Shortly after announcing revenue of $710 million and a net loss of $90 million, shares were down by more than 11% . The bad news adds to a long list of recent setbacks for the company, with some even questioning whether it has a future: “Since it went public two years ago, investors have rarely considered Twitter’s prospects rosy,” the Atlantic wrote in November. Unlike other social media leaders, such as Facebook, the micro-messaging service has struggled to find a solid and sustainable revenue model. 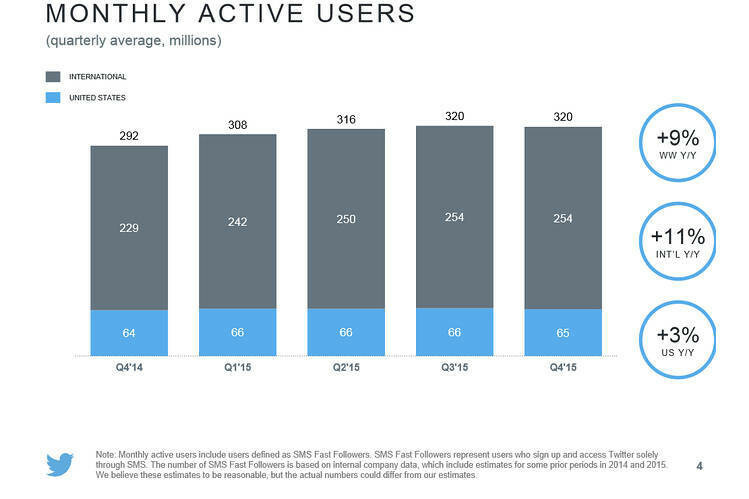 In 2014, for example, Twitter earned $1.4 billion but still ended up with a net loss of $577 million . It has also found it difficult to expand its user base, with many finding the stream of content overwhelming and difficult to navigate. In 2015, it saw little in the way of growth on the US market, and its latest announcement suggests user growth may even be declining. But for all the talk of an imminent demise, Twitter is still more relevant than ever. Its power lies in the way it has completely transformed how we talk and find out about important issues – and, more importantly, how we take action on them. In September 2014, actress and UN Goodwill Ambassador Emma Watson launched HeForShe – a global campaign aimed at getting men and boys involved in the fight for gender equality. Soon, high-profile men were tweeting their support for the movement and calling on others to get on board. In the space of a few weeks, the term “feminist” went from being a dirty word to one that everyone from Harry Styles to Barack Obama were openly embracing. Earlier that year, another Twitter campaign brought awareness to the plight of the 276 Chibok girls who were kidnapped by Boko Haram. Within a few weeks, the hashtag had been tweeted millions of times. Some have questioned whether this type of “clicktivism” really does make a difference, or whether it just makes users feel like they're doing something positive. But for the Nigerian lawyer behind the #BringBackOurGirls campaign, it brought international attention to an issue that would have otherwise been brushed under the carpet: “Before #BringBackOurGirls came into being, there was almost a total news blackout about the abduction of the schoolgirls,” Ibrahim Abdullahim told the Washington Post . Healthy democracies rely on both civic and political participation. But as decision-making powers have moved from small constituencies to larger bodies, many people have been left feeling voiceless. In European countries, for example, a “democratic deficit” has led to declining voter turnout and disengagement. Platforms like Twitter have been changing this: “By providing a new form of communication among politicians and citizens, social media may provide a way of increasing citizen involvement in political life, especially during election campaigns,” the European Parliamentary Research Service wrote in 2014 . Studies since the uprisings have confirmed the role social media played in helping protests gain momentum: "Our evidence suggests that social media carried a cascade of messages about freedom and democracy across North Africa and the Middle East, and helped raise expectations for the success of political uprising," researchers from the University of Washington found . To sceptics, it might seem like Twitter is just a stream of selfies, inane ramblings and food shots. Do you really need to see another picture of your colleague’s dinner? Well, yes, because it might actually help feed someone in need. With its #mealforameal campaign , Virgin have donated over 300,000 meals. It’s just one of many instances where Twitter has helped turn online actions into positive change in the real world. The #NoMakeUpSelfie campaign , which raised millions for cancer research, is another example of the way social media can mobilize support for important issues. Have you read? Sheryl Sandberg: Social media can help beat ISIS Which are the social media platforms of the future?